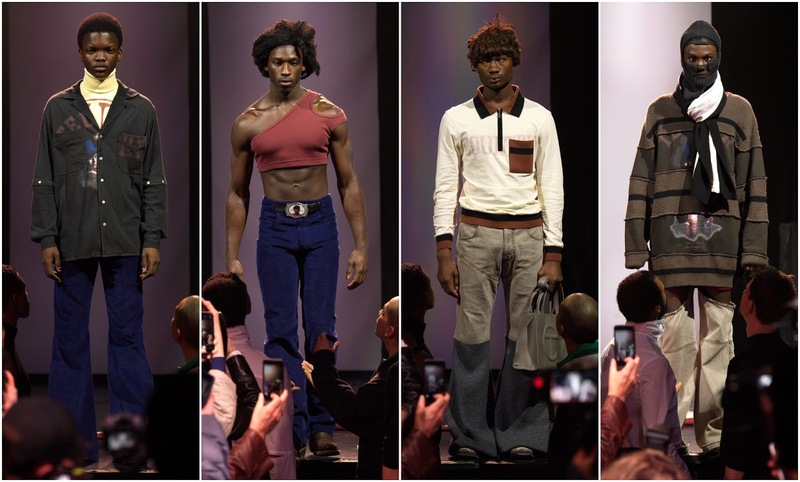 Telfar Clemens didn’t showcase his fall 2019 collection in a traditional manner. In lieu of the conventional catwalk show, where models emerge from the backstage area and strut for twenty-five metres, Clemens’ models walked out, dived into a mosh pit and crowd-surfed. Entitled ‘Country’, the clothes weren’t the sole focus. There was too much going on to catch a glimpse of them. But study the images online and you’ll see some of Clemens’ recurring motifs. Once again, he proposed Y-shaped crop tops, trousers akin to chaps, deconstructed sweaters. There were polo shirts and grandfather cardigans alongside flared denim and fringed t-shirts. Was Clemens democratising symbols of class? Were garments deconstructed in order to accentuate the importance of rebuilding and starting afresh? A mosh pit like any other—the metaphoric resonance of community spirit unmistakable. In Telfar’s country, inclusion is essential. From his diverse casting to the banding together of creatives from different spheres, Clemens’ vision is full-bodied, bursting from the seams with deeper meaning. Clemens is remaking American fashion one season at a time. He’s challenging perceptions of race, gender, and class with such belligerent force that one can sense his restlessness and resilience. His clothes don’t always bear the same impact as his ideas but, right now, that’s okay. With a few other authoritative voices around, his presence on the schedule provides a sense of hope for American fashion and beyond.